America's historical involvement with the Muslim world and Israel, respectively, precedes its recognizing Israel's independence in 1948. Professor Michael Oren (author of "Power, Faith, & Fantasy: America in the Middle East 1776 to the Present") explains the role that Zionism and the Islamic world have played since America's founding. The speech is presented to benefit Childrens' Hospital Los Angeles', "Teen Impact" cancer therapy program. Learn more at Celebrate Life with Hope. One of the most ancient and persistent enemies of the Jewish people was the nation of Amalek, the first enemy to attack the Jews after the Exodus from Egypt. A descendant of the Amalekites, Haman, had ascended to the position of "prime minister" of the Persian Empire. This rabid anti-Semite planned an empire-wide pogrom to eliminate the Jewish people. He chose the date for this mass murder by casting lots. In Persian, the word for lot is pur. The plural form is Purim, hence the name of the holiday. 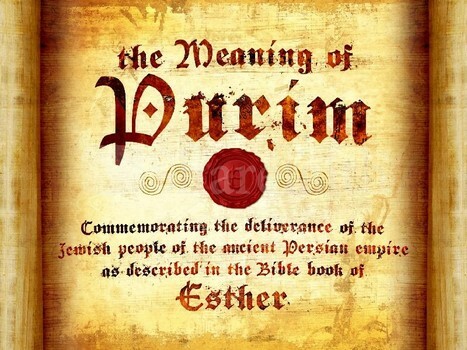 The heroine of the Purim story is Esther, a devout Jewish woman who was forcibly taken as a wife for Achashverosh. She and her uncle Mordechai, one of the religious leaders of that generation, were instrumental in saving the Jewish people from annihilation. After uniting the Jewish nation in repentance and prayer, they set about exposing Haman's plot to the king. Haman and his equally wicked sons were executed when Achashverosh learned that he had planned to kill Queen Esther's nation. The Jews were permitted to defend themselves against their enemies on the appointed day for annihilation, and were totally victorious. 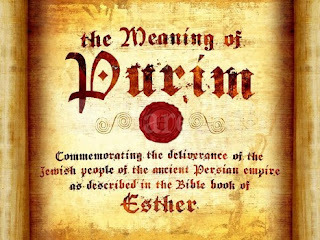 Mordechai and Esther recorded the events of Purim in the prophetically inspired Megillat Esther (literally, Scroll of Esther). The Megillah is read publicly on the night and day of the Purim festival. Three years after the events of Purim, King Darius, the son of Esther and Achashverosh, allowed the Jewish people to return to Israel and rebuild the Temple. The Temple was rebuilt exactly 70 years after its destruction, as predicted by Jeremiah. On Purim we celebrate the fact that the hand of God guides us, even at times when we do not see open miracles or obvious Divine intervention. When we read the Megillah, we are not awestruck by dramatic changes in the laws of nature, but by a series of seemingly disconnected events that ultimately resulted in the salvation of the Jewish people. Achashverosh executed his first wife and chose the beautiful Esther as his new queen. These are not miracles, but behavior to be expected from a despotic king. Nor was it a miracle that Mordechai once saved the king from an assassination plot, thereby earning his gratitude. Each event, in and of itself, was not miraculous or even exceptional. When seen in retrospect however, the series of events is seen as engineered from Above for the purpose of evoking repentance from the Jewish people and then saving them from danger. This theme of allusion may also be the reason behind the custom of wearing costumes on Purim. The masks and costumes show that truth always lies beneath the surface, that the physical world conceals the true spiritual reality. The reading of the Book of Esther by The Happy Minyan of Los Angeles precedes their revelry. While the events of Chanukah were principally a threat to our spiritual survival, Purim recalls a threat to the physical existence of the Jewish people. Haman attempted to physically destroy every Jewish man, woman and child. We celebrate our deliverance from this threat with mitzvot that focus on the physical. We give money to the poor and gifts of food to our friends; we eat a festive meal and drink wine. Giving gifts to one another also promotes unity among the Jewish people. When first proposing his evil plot to Achashverosh, Haman described the Jewish people as a "scattered and dispersed nation." He did not mean only that we were geographically dispersed, but that we were not unified, and thus would be easy prey for our enemies. (On a spiritual level, we also understand this to mean that when the Jewish people are disunited, God does not protect them fully. National unity brings about spiritual wholeness and closeness to God.) To counteract this situation, the Sages decreed that we must be concerned with the welfare and friendship of our fellow Jews. We strengthen Jewish unity by giving gifts to the poor, food to our friends, and by celebrating together with festive meals. (Courtesy Rabbi Mordechai Becher: Gateway to Judaism; The what, how, and why of Jewish life) available from Artscroll Publishing.